A while back, it was the volume manufacturers that offered the greatest variety of models. Now they have rationalized and concentrated on a few core models. By contrast, the premium brands have a seemingly endless stream of variants. Audi says that its continuous programme of new model launches is why it is now able to challenge BMW and Mercedes in premium car sales. In 2004, Mercedes introduced the CLS  a long, low, sleek and slightly flash four-door saloon. BMW's counter, when it came, was the X6, a coupe-SUV crossover. Both have sold well, particularly in the growing markets of Asia and the Middle East. Now, while Mercedes works on a new sporty SUV derivative, BMW has brought out its equivalent of the CLS. Unlike its rival, the 6-series Gran Coupe is clearly derived from an existing model, the 6-series Coupe that was launched last year. So while we might call all cars of this kind 'four-door coupes', BMW's newcomer really is that  a 6-series stretched by 11cm with two more doors. BMW says that this makes the Gran Coupe a more authentic sporting car than the CLS, or the Audi A7, which are based on conventional saloons, and invites comparison with the Porsche Panamera instead. That seems fair enough, especially when the biggest-selling version in Europe will be the 640d Gran Coupe, with a 3-litre six-cylinder diesel engine, and Porsche has recently introduced a Panamera diesel at a similar price. The Gran Coupe and Panamera are the same size and offer similar accommodation  both have surprisingly good rear seat space for two grown-ups. Although it is a subjective judgement, we think most would agree that the BMW looks better; for us, the Gran Coupe's styling is second only to the much more expensive Aston Martin Rapide. With 313PS from its twin-turbo engine, the 640d is both faster and more refined than the 247PS Panamera diesel. Those who have not yet come to terms with the idea of a diesel sports or Grand Touring car would be easy to convince with this BMW. The 640d claims 0-100kmph in 5.4 seconds  just about as quick as a Mercedes CLS500 V8 - and eagerly attains its regulated top speed of 250kmph. The two turbochargers are arranged sequentially, so that a smaller turbo provides better low-end response. The result is generous torque  630Nm  produced from 1,500rpm and, combined with the latest ZF eight-speed automatic transmission, it provides fierce and relentless acceleration to 150kmph and beyond. Full performance is accompanied by a rich exhaust note almost like an American V8 muscle car. And, of course, because it is a diesel, the 640d's consumption figures are remarkable  17.85kmpl on the combined EU drive cycles. Like the two-door 6-series, the Gran Coupe can be ordered with a 320PS 3-litre six-cylinder (640i) or 450PS 4.4-litre V8 (650i) petrol engine but it is hard to see why you would choose either when the diesel is so good. What BMW calls EfficientDynamics technologies are included: high overall gearing, brake-energy recuperation, and automatic stop-start, which saves fuel when stationary in traffic. The eight-speed transmission is the first torque-convertor automatic to enable stop-start. BMW provides the Gran Coupe with all of its latest technology, including Adaptive Drive, which offers a variety of programmes for damping and adaptive anti-roll bars. Five different settings may be more than most drivers want or need but for normal road use we would recommend settling on 'Comfort+' mode, which is a good balance of body control, responsive handling and ride comfort. The longer wheelbase actually improves the ride and handling compared with the two-door coupe. In terms of furnishings and presentation, the main difference between the two types of coupe is of course the rear seat area. Entry and exit for rear seat passengers is through rather narrow doors, from which the quarter-windows protrude, and there is really only room for two, although a third, centre seat belt is provided. BMW likes to call the Gran Coupe a '4+1' but anyone sitting in the middle needs to be small and has to straddle a high transmission tunnel. Two passengers are very comfortably accommodated in individual seats, rather as in the Panamera. There is a surprisingly airy feeling of space back there and it would be even nicer with something lighter like the white in the pics rather than the all-black trim and headlining of our test car. The instruments and controls are familiar from the 6-series coupe and generally logical and easy to use. The exception is the fiddly transmission selector which requires the button on the side of the lever to be depressed before it can be moved. Paddles behind the steering wheel can be used for manual gearchanges but the combination of low-down torque and fast but almost imperceptible automatic shifts make them redundant most of the time. The angled centre console sweeps round to the passenger side and forms separate and subtly different environments for driver and passenger but both of them can view the huge 10-inch colour display screen and access the i-Drive control knob to the left of the transmission selector. The front seats, with built-in belts, are excellent, generously shaped but still supportive. 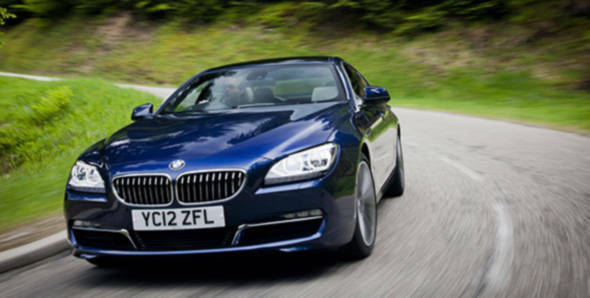 For us, the 640d Gran Coupe is a very convincing GT car, capable of cruising at high speed in quiet comfort. It is superior to its two-door equivalent, and for those who don't need limousine space, is also a practical and stylish alternative to the 7-series saloon.